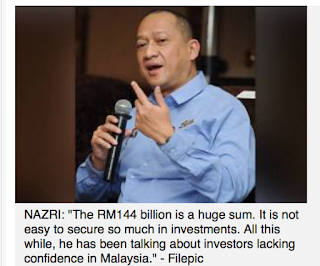 Really Nazri, Mahathir jealous of Najib's China success? Sunday, 6 Nov: I don't often agree with Nazri Aziz but the point he underscored in Jealousy prompted Dr M's comments (Malaysian Digest, 3 Nov) made me look back at Mahathir Mohamad's own politics re China when he was PM. A lot of people forget that Dr M tried very hard to be in China's good books. Through his ambitious but ill-fated East Asia Economic Group (EAEG) proposal, he tried to get China to lead Asia, together with Japan and South Korea, against America and Europe. EAEG was renamed a Caucus after consultations with spooked and reluctant Asean partners (and Japan and South Korea) but it remained a proposal until the end, much to Mahathir's chagrin. Imagine if he had succeeded! 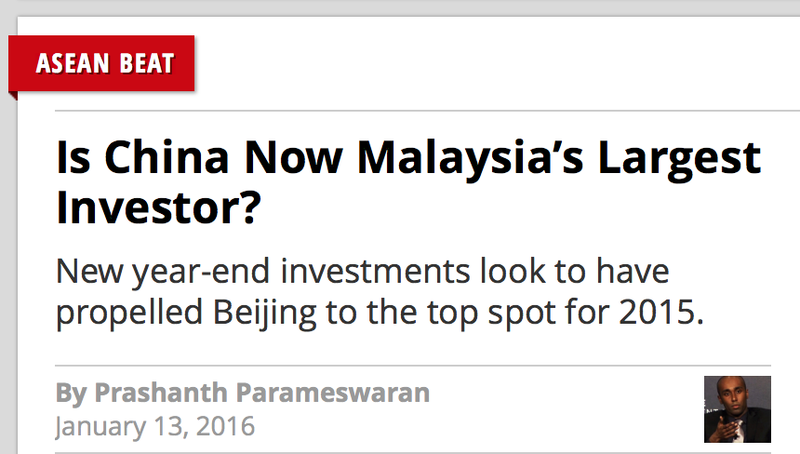 It would have been Mahathir announcing last week's historic RM144 billion Chinese investment into Malaysia, not Najib! In any case, China (not the US or Japan) has been Malaysia's largest trading partner since 2009, the year Najib became PM. Quite naturally, the biggest trading partner would start bringing in huge direct investment into Malaysia, just as the US and Japan had done before, and become this country's leading investor. But that's something not only Mahathir finds difficult to accept, whether out of jealousy or his own past failure to put China in his pocket. "That said, even if official data eventually does show China as being Malaysia’s largest foreign investor, that could just be a 2015 aberration instead of a sustained trend, given the uniqueness of these year-end investments. As The Post notes, it will be difficult for Beijing to sustain the top position since Malaysia’s plan to become a high-income nation by 2020 prioritizes high-value industries, with such investments typically coming from traditional sources like Europe, Japan, Singapore, and the United States." A lot of people having to eat their own words. I think that's why they hate Najib. By Helen Ang, DAP got nothing to say about Beijing's embrace of Najib Razak? He does not deserve our money too. We knew he is undeserving. Today collaborate with evil jew ... soros and murdoch!!!! "I don't often agree with Nazri Aziz but the point he underscored in Jealousy prompted Dr M's comments (Malaysian Digest, 3 Nov) made me look back at Mahathir Mohamad's own politics re China when he was PM." Well, that's the difference between us, Latuk. I will happily agree with anyone as long as my PMO cheque gets banked in on time. I may even follow RPK and, like a good little parrot, repeat the words of intellectual giants like S S Keruak verbatim. Here, have more birdseed. Ahhhhh, prostitution. It's a good life. Itu orang Kadir Jasin lagi mau komen pasal RM144 billion. Kita komen dalam dia punya blog dia terus block. Mana ada standard itu punya orang. Tumpang tanya- sejak bila beri kontrak dan pinjam wang dari negara luar dikira sebagai Pelaburan Asing? Nazri Aziz bodoh, yang percaya dia pun bodoh. 55 billion is a soft loan. Its like that 975million ill fated loan from Deutsche Bank led consortium of bank. If count this way, then it isnt 144billion. Its much higher. We have got to calculate 1mdb foreign loans as well! I'm glad that I send my eldest son to SRJK(C). It help him a lot in looking for a job after graduation. Before... I thought that Najib was going American... play golf with Obama, visit Facebook founder and even selfie'd with Zuckerberg. 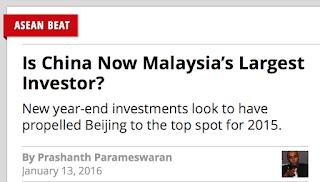 But now... after DoJ's claim... Najib's is looking to China. He even hired another 'adviser'... Jack Ma for gomen's digital economy. Looks like Malaysian should learn mandarin in future. Therefore, more demands for SRJK(C). But we should all take up Mandarin, if we have the talent! And Arabic! The Muslims in Chinese speak these two languages and survived under the Communists! If China buys our kelapa sawit, some people will cry foul and claim that "We've sold off our kelapa sawit to China!" I thought, both you and Dato Kadir disallowed Anonymous commentaries. Or was it an exception since the above Anon wrote negatively about your ex-boss? "If China buys our kelapa sawit, some people will cry foul and claim that "We've sold off our kelapa sawit to China!" That's the state of some people's mental hysteria. You get the picture ..."
Dulu sy ingat DAP would sell malaysia to china,,rupa2 najib dah tolong jualkan siap2..
You mean this comment by Anon! Kadang2 TER-lepas. You know lah, ramai sangat Anonyous commenters ni. How I wish they - including those who use all those fancy nicks - would unmask and feel free (and fearless) to leave comments. I understand, though, believe me .. I understand why they won't.